The Nauset Rotary Club serves the four towns of Cape Cod's Nauset Region on the Lower/Outer Cape: Brewster, Orleans, Eastham and Wellfleet. 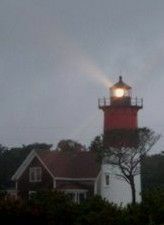 The Club's logo is The Beacon from Nauset Lighthouse as it shines across the foggy horizon of Cape Cod National Seashore and the Atlantic Ocean. As with all Rotary Clubs across the world, Nauset Rotarians' vision is for World Peace and Understanding. The mission is Service Above Self. And the core values are expressed in the 4-Way Test: Is it the truth? Is it fair to all concerned? Will it build good will and better friendships? Will it be beneficial to all concerned?